November | 2013 | ohdenny. 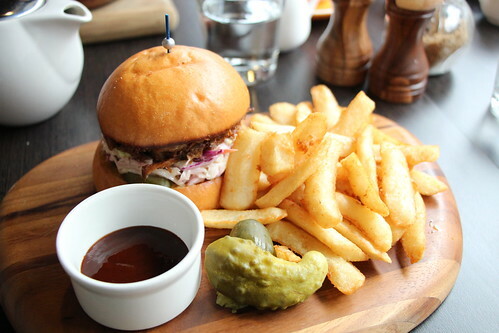 A La Bouffe on Toorak Rd, South Yarra is one of the many French restaurants around these parts of town. I was trying to pick a good one for a special occasion and was deciding between France Soir and A La Bouffe but saw a string of negative comments surrounding France Soir lately. Not particularly due to the food itself but the service being subpar. 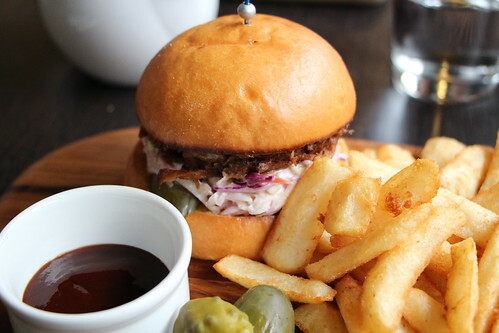 With A La Bouffe also offering a Lunch Specials menu where you can order two courses (a pick of Entrees, Mains and Desserts) for $27 or $35 with a glass of wine and coffee it seemed too good to pass up. 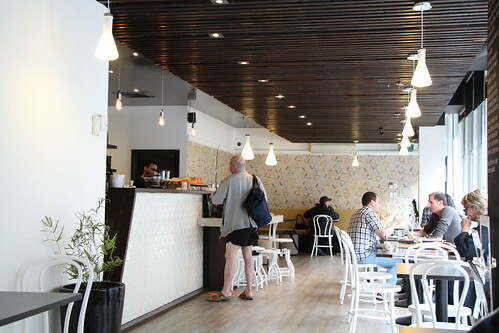 A La Bouffe is a small, stylish restaurant that feels cosy yet sophisticated. Their menu is extensive and although the lunch specials menu opts for a smaller selection from their menu, it offers a diverse range of meals to cater to all. Feeling a bit lucky we ordered the Soup Of The Day (Soupe Du Jour), on the Sunday that we dined on they served an Asparagus Soup. Creamy, but more so subtle taste of asparagus that lingers on the tongue. A pleasant soup, and with a sprinkling of black pepper it makes it pop. The asparagus pieces still have some bite to them which adds texture. Some may prefer it to have a bit more salt seasoning on it, but I find that sometimes withholding salt makes for a very nice starter. 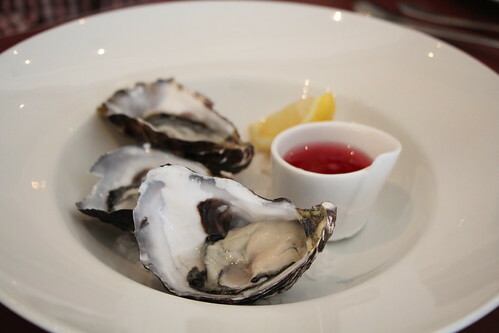 The Huîtres de Coffin Bay aka 3 Natural Oysters from Coffin Bay was fresh, and tasted like the sea. What appears to be a vinaigrette of some sort or a balsamic vinegar in the little cup isn’t something I’ve tried with oysters before. Interesting taste with it but probably wouldn’t do that again. 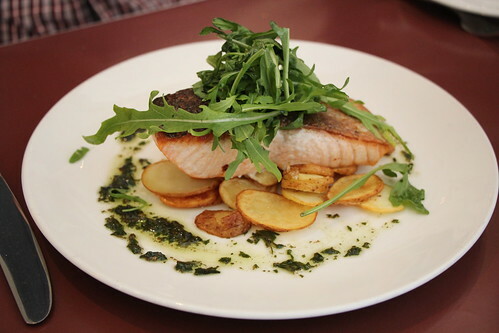 The Saumon De Tasmanie or otherwise known as Oven Baked Salmon with Crispy Potatoes & Pesto Vinaigrette was a lovely main course. I adore Pesto, it’s a fantastic marinade, flavouring, sauce etc because it’s just so fresh and having it with salmon always goes down a treat. The slight downside to the dish was I found the salmon to be a bit overdone, it was cooked all the way through. I definitely prefer my salmon to be a bit undercooked so the inside can slowly cook whilst you’re eating and then it won’t taste as dry. On the bright side, the salmon skin was extra crispy which was lovely. A fresh dish that was unfortunately let down by the salmon. 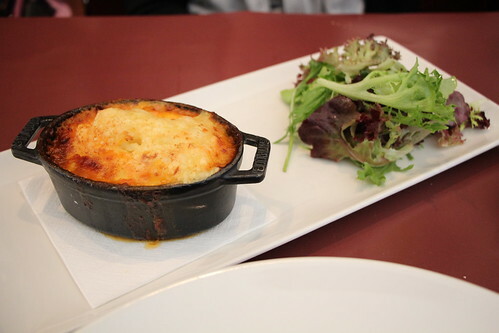 A La Bouffe’s Hachis Parmentier (French Sheppard Pie) comes out straight from the oven, steaming hot with a side of salad. I couldn’t quite tell what’s the difference from an English Sheppard’s Pie or any other countries version. 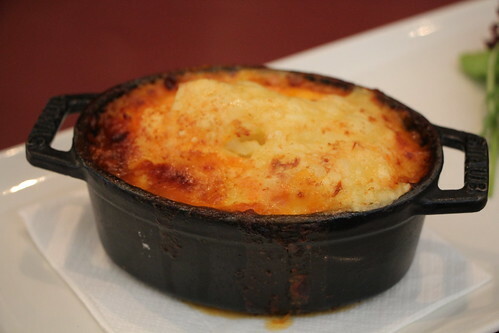 The fluffiness of the mash potatoes was certainly the highlight, along with the cheesy top. The mince meat deep inside was flavourful, maybe a tad under salted (a bit of pepper would be great too). Very filling I must say. 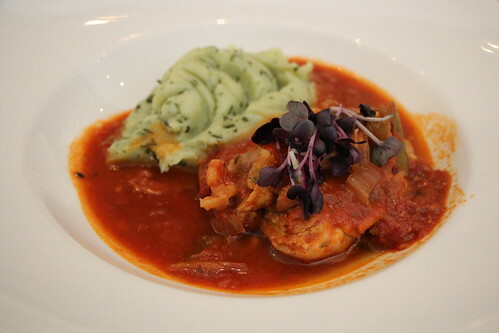 The waiter recommended the Poulet Basquaise which is basically chicken cooked in a tomato, capsicum and garlic sauce served with a side of pesto mash. The tomato based soup was fantastic, packed full of flavour that worked so well with the chicken. I could really have that sauce on anything it was so good. Again, unfortunately it has a big downside, the chicken was definitely overcooked. I know sometimes restaurants like to be safer than sorry and especially with poultry but I don’t remember a time when I’ve ordered a piece of chicken that had been so dry. Luckily they were generous with the sauce as it was definitely needed to complement the chicken but it really shouldn’t happen in a place like this. 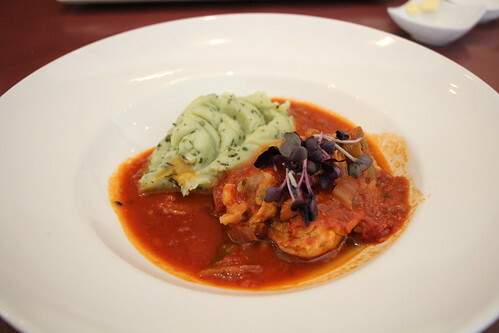 The pesto mash was stunning. Creamy, buttery and that pesto flavour just exploding in your mouth. A mash that I would like to find a recipe of because it was cooked to perfection. For dessert we ordered the Crème Brûlée A L’orange & Cointreau. Translation, Crème Brûlée with orange and Cointreau that is torched on your table for that extra effect. For $15, it’s asking for a lot but it feels worth its price. The custard base is so silky smooth and creamy with the hint of orange flavour and the nice crunchy sugar topping gives it a nice crunch. 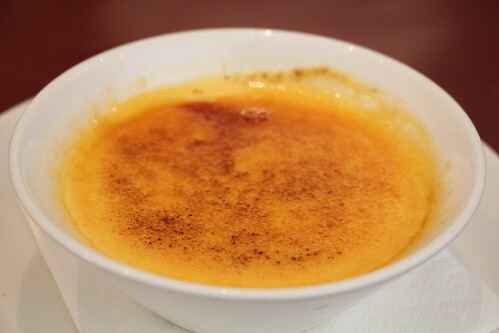 One of the best Crème Brûlée’s I’ve tried but that’s not really saying much as I haven’t ordered that many before! 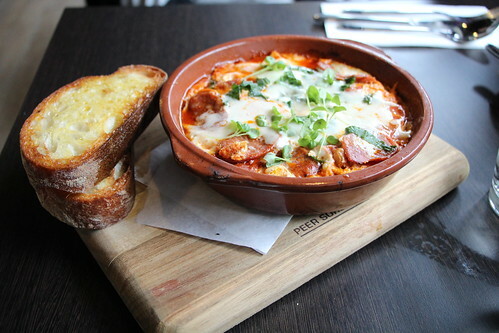 A La Bouffe’s dishes are tasty and might be worth it’s price for the lunch specials. Points are knocked off for the overcooked salmon and chicken. I could overlook one overcooked dish but two were definitely way over which was a bit disappointing. I’d like to say we dined on an off day as many diners have had better experiences that we have had but I really don’t know. The flavours of the dishes are highlights for me. Would I dine again? It’s a maybe for now. 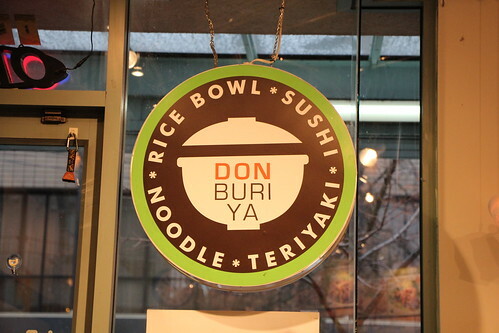 Don Buri Ya on Robson Street, Vancouver is what I’d call Japanese Fast Food. Quick and easy meals, that taste great too. Dishes can be ordered in varying degrees of size, ranging from rice dishes to noodles as well as snacks/appetisers such as Takoyaki. 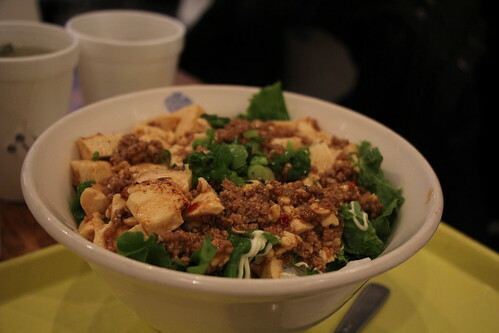 The Minced Beef with Tofu is similar to the Chinese Mabo Tofu, very similar to be frank. I never realised Japanese cuisine also had a similar dish but what do I know. Nothing spectacular with this dish, just tasty Mabo tofu on Rice with a slight hint of chilli. Their Teriyaki Chicken Noodle soup is nice on a cold day, well, like most soups are anyway. Packed full of flavour with perfectly cooked chicken. It’s a great tasting dish. 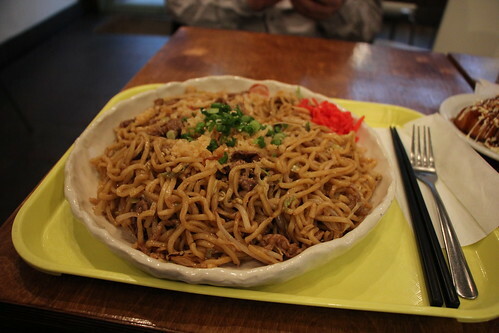 Their Yakisoba is gargantuan, I believe I ordered a medium, and it definitely can serve two quite easily. I wasn’t fond of this dish to be honest, it lacks any kick. It feels like eating a soya sauce stir fried dish. Being a big fan of Takoyaki, these little balls lack the crispiness are are also unfortunately too full of the flour mixture and only the tiniest octopus pieces can be found. 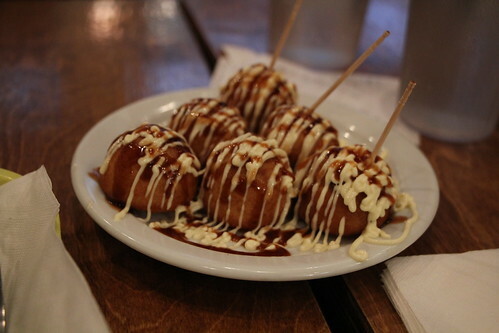 The mayonnaise and Takoyaki sauce (similar to Okonomi sauce) are tasty though. It’s just a disappointment these were mostly soft and basically very average. 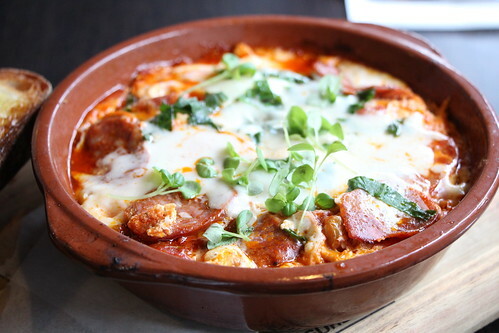 Whilst my review of the dishes may seem a bit harsh, I still believe for a quick and easy meal it’s still worth a try. Not the greatest Japanese food I’ve tried but definitely nowhere near disastrous. 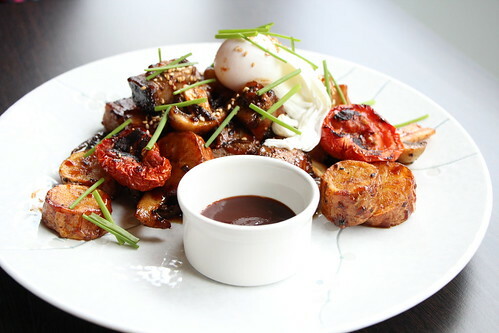 Cafe Soho on Kingsway, Glen Waverley is a Hong Kong style restaurant that replaced the Italian styled cafe before it. I recall there being another Hong Kong eatery on Kingsway before Petaling Street took its place and I actually was kinda fond of that restaurant. 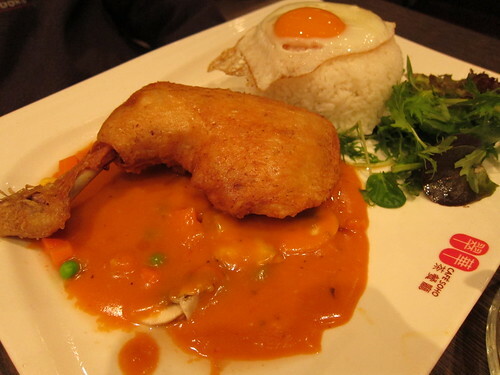 Cafe Soho is quite similar in its cuisine but definitely has a larger more diverse menu. The image on top is a very Western meets Chinese, with its fried chicken and a creamy tomato based sauce with sunny side up egg and salad. The chicken is nice and crispy, tender inside. I found the sauce to be a bit bland, not much seasoning (it definitely needs pepper or chilli flakes) and it tastes a bit odd with rice. I guess some people may be used to this kind of cuisine but it still feels kind of strange. 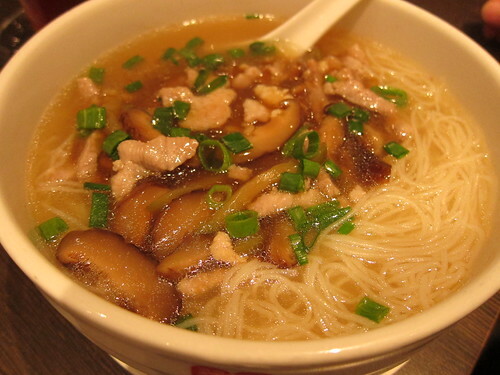 Their vermicelli noodle soup with mushrooms and pork is a pleasant dish albeit a bit oily as you can see by its sheen. 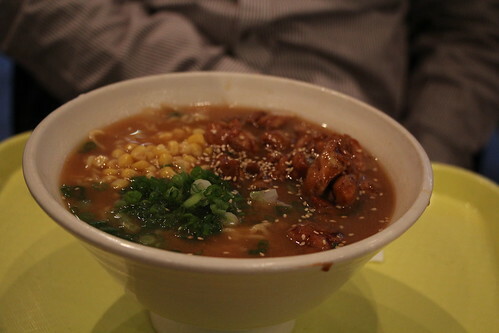 Sometimes hot noodle soup is just great on a cold winters day. Nothing too exciting to see here, to be perfectly honest. 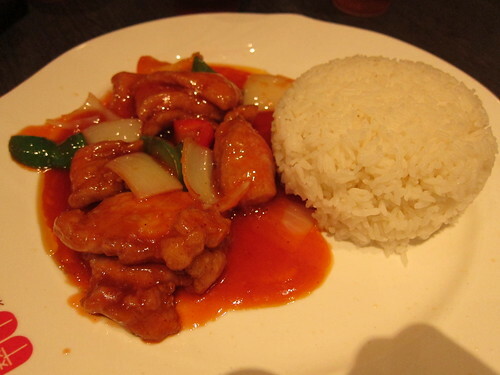 Also ordered the Sweet and Sour Pork with rice. I believe they deep fry the pork before stir frying which gives it a nice crispy bite to it. The sauce lacked the sourness from the tomatoes, and I felt was a bit too sweet. The larger meat pieces works well here, as opposed to Grand Tofu’s version but I actually do prefer Grand Tofu’s Sweet and Sour Pork even though their meat to skin/flour ratio is low, and sometimes there is an airiness to the meat (balls) that isn’t too appealing. A decent meal. 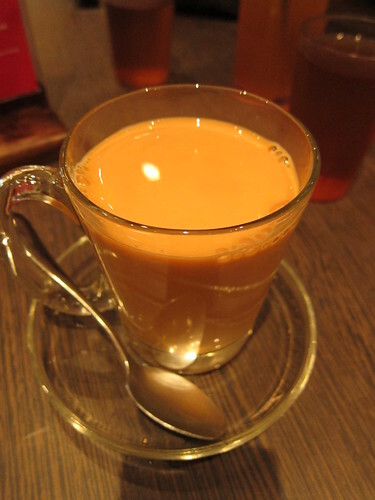 Hong Kong styled Milk Tea is a bit different to Malaysian Milk Tea or the Bubble Teas as it uses evaporated milk instead of condensed (Malaysian) so you have this tangy, slightly bitter but still retaining some sweetness drink. Here, it’s done well and it comes in a nice cup and saucer. I actually had to add a bit of sugar because it wasn’t all that sweet. A nice drink. 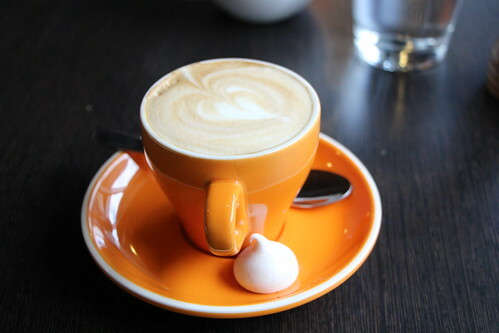 Cafe Soho I feel is a bit hit or miss with what you order, nothing here is offensively bad but I feel nothing really stands out and I’ve been here a couple of times and I don’t even remember what I’ve ordered. It doesn’t leave a lasting impression but will be sufficient enough to fill you up. 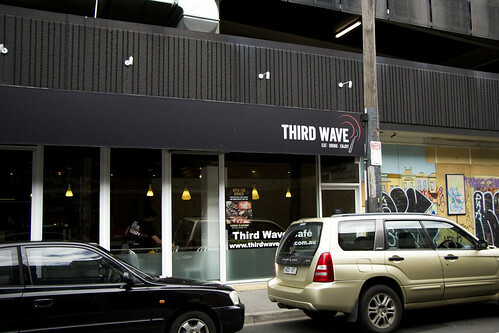 Overall I’d say its a bit bland and wouldn’t go out of my way to eat here but as an option I wouldn’t mind going back. 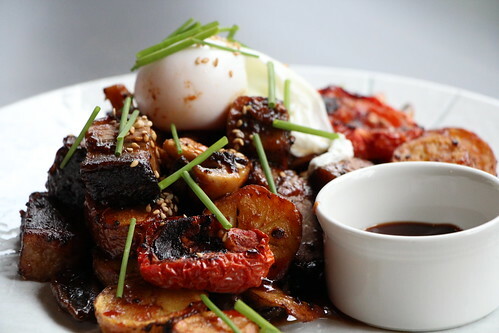 It has a disastrous rating on Urbanspoon though, so I guess diner beware? I ordered the Beef sausage Pho just to try something a bit different (a bit unusual), the soup base lacks a bit of flavour and I also noticed they do not add coriander as a garnish to their soup. 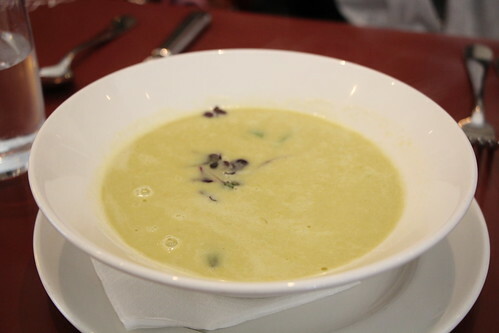 That’s not to say the soup was bland, it definitely has a nice flavour to it but compared with the greats in Melbourne, it is just a bit lacking. The plentiful of onions they add are very strong in taste, probably too much onions for my liking but some might be preferential to their generosity. The beef sausage falls apart very easily, I’m not sure how it’s made because it’s almost like eating mince meat with a bit of pepper balls as seasoning. Not the best sausage I must admit, I think the beef and chicken would actually taste better together. 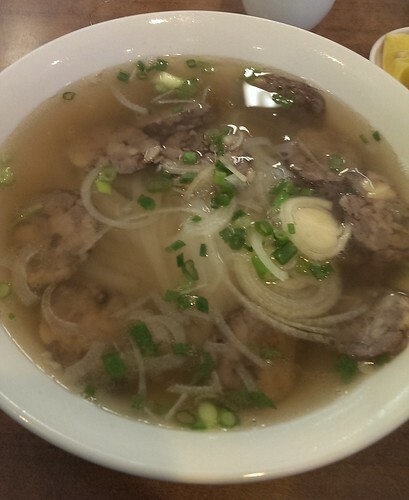 Finding good Vietnamese food in Box Hill is a challenge, so my opinion on Pho 888 is that it’s sufficient but if you miss great Vietnamese food from places in Richmond and Springvale, or maybe even Footscray, you may be a bit disappointed.